Easily placed on top of an outdoor kitchen mantel. I am very happy with the oven. It as delivered 3 days after I ordered it. The quality was perfect. No dents scratches and every piece looked amazing quality. Pizza cooked in about 3-4 minutes and came out perfectly. I highly recommend the oven. Perfect quality retains excellent heat. Highly recommend it and the size is perfect. The pizza oven was more than we expected. Clean up of ashes is so easy with pull out drawer in back. We are very satisfied with our oven so far. You can make fresh hot crusty pizza in minutes! We used this oven couple of times, but the output from the oven will really make your day, you can easily make a pizza in 90 seconds or close. Ilfornino support staff is relly supporting and they respond very quickly to all my questions or queries that I have related to the product. I was looking for an outdoors oven for a couple of years now. 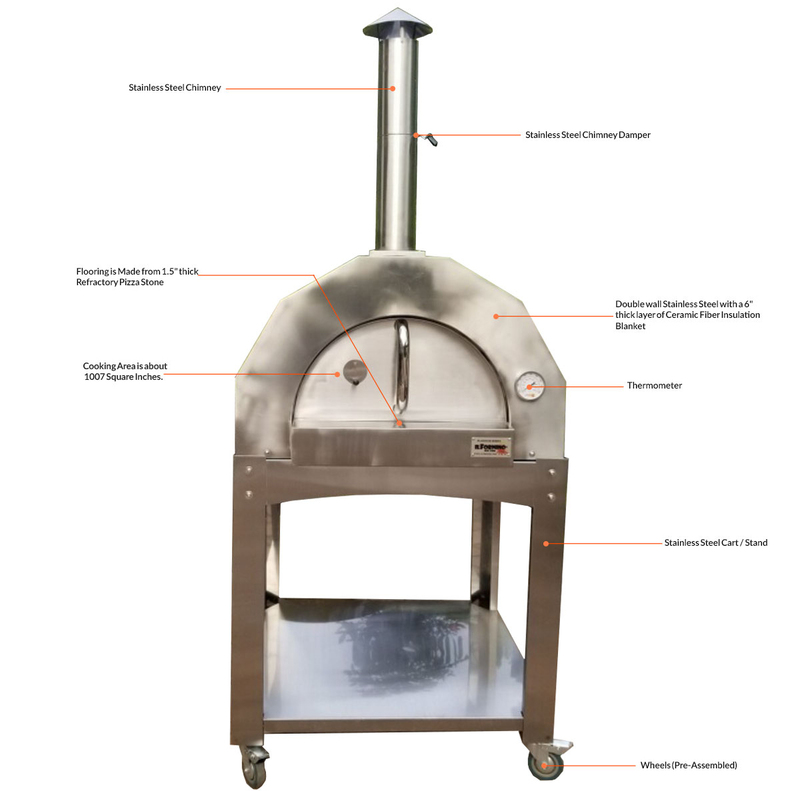 After researching several ovens I decided on the IlFornino. Was waiting to pull the trigger for a while. Was going to buy the Pro Plus. Checked their website on 4th of July (of all days) and saw the Platinum Oven. Plus was on sale. So I ordered that night. Had the oven 3 days later. I'm in New England. Shipping company was very nice. Was going to install on the cart but Wife decided to put on the counter of our outdoor kitchen. Her and I muscled it up (would recommend you ask a friend or two) with the included handles. It was not that bad. All I had to do was install the Smokestack. Looks and Built like a brick house. I was very impressed with the build. I fired it up two days later. Used 3-4 pieces of nice dried oak. Took about 45 min. to get it up to 600º - 700º. We fired up the first pizza. Came out great. Just need to thin out the dough a little more. My fault. After that turned out 10 pizzas. All perfect. Not a long learning curve here. Took about 2 min. for each pizza. Everyone was very impressed with the food as well as the oven. Even got a couple of friends to make and cook their own. Oven stayed hot for a long time. May take a little time to get the amount of heat for different cooks but look forward to giving it a shot. This is my first and i assume last oven. Again Build quality is fantastic. Works amazing. I cannot wait to start firing up other dishes. I would also add that the Ash Shovel did not ship with the oven. 1 Email to the sales dept. and it was shipped out immediately. That tells me that this company stands by their products. Also the accessories are built like professional pieces. In my opinion, I highly recommend this oven to anyone out there looking. At this price point and how well it is built. You cannot go wrong.